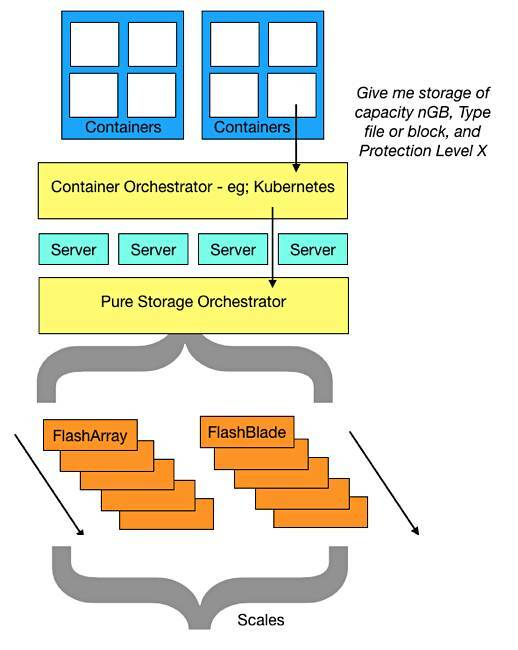 Analysis Last year flash array shipper Pure Storage built plug-ins so that container orchestrators, such as Docker and Kubernetes, running in a server could interact with an array and provision storage for a stateful container. As container usage increased, there was a need to scale out the arrays and servers, which meant repeated per-array integrations with the container orchestrator. Container admins would write detailed container pod definitions for this. But Pure realised it would be better if the resources of a set of its arrays – FlashArray, FlashBlade or a mix of both – could be presented to the container orchestrator by a single entity, a virtualized control plane for its arrays. This Pure Service Orchestrator (PSO) – which hit General Availability late last month – would receive storage provisioning requests and deal with them in real time, setting up paths between containers and the back-end arrays. Containers or developers tell the container orchestrator how much capacity they need, whether it is file or block, and the kind of protection needed. That orchestrator tells PSO what is needed and PSO assigns the storage, with a view to balancing performance across its arrays. Policies can be used to guide PSO in its decisions and automate the process. We would not be surprised if an object storage type was added to the scheme. The containers have storage provisioned to them on demand, with Pure referring to this as Container Storage as a service (CTaaS), although the company makes no specific mention of charging for such provisioned storage. However, it seems to El Reg that charging for CTaaS is a possibility, and one that might be welcomed by Pure's MSP customers. Pure already has its Evergreen Storage Service pay-per-use business model. CTaaS could slot right into that. The PSO opens the way for a Pure on-premises infrastructure to support thousands and even tens of thousands of containers needing storage resources. PSO has been launched by Pure and is said to be self-healing, meaning it can recover from node failure and deal with Kubernetes split-brain scenarios. You can check out a datasheet here (PDF). This multi-array abstraction layer providing a control plane seems a generally applicable idea for providing storage to containers. ViPR Controller enables storage arrays to be added to a virtual data centre and for their storage pools to be used as the target for block and file storage provisioning operations.